Magnaflow Competition Exhaust System 08-14 Dodge Challenger SRT8 Magnaflow Competition Series Exhaust System 08-14 Challenger SRT-8, MagnaFlow 16885 Exhaust Kit, Magnaflow Competition exhaust System, Dodge Challenger 6.1L Magnaflow Competition exhaust System, Dodge Challenger 6.4L Magnaflow Competition exhaust System [Magnaflow 16885 Exhaust Kit] - $1,433.95 : 3rd Strike Performance, Your Source for Late Model MOPAR Performance Parts and Accessories! The MagnaFlow Competition Series exhaust systems are designed for those seeking maximum performance, reduced mass, and an aggressive exhaust note that demands attention. They feature all mandrel-bent tubing and 409 stainless steel construction. These kits are available in numerous configurations, including cat-back and rear axle-back styles; single or dual mufflers; and one, two, or four outlets. Many tip options are offered, as well. MagnaFlow Competition Series exhausts increase your horsepower and torque for better results on the track, and they carry a lifetime construction warranty. Competition series exhaust system. 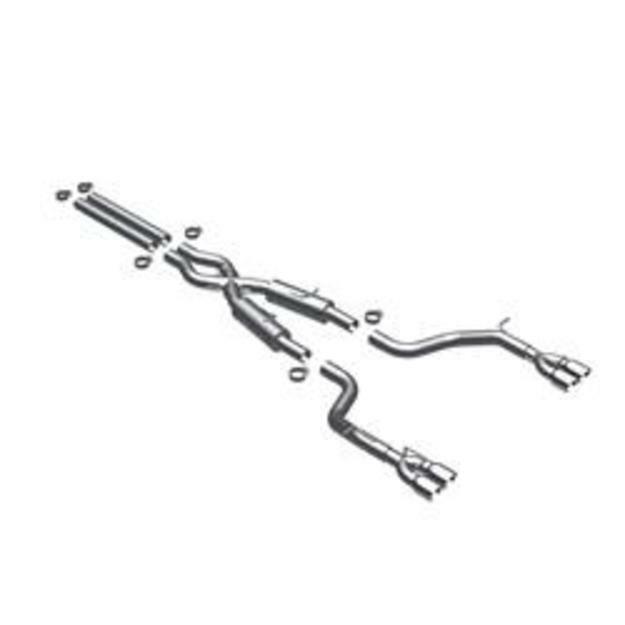 Kit includes Tru-X muffler assembly. *Note: This system may not comply with all local or federal noise requirements.